Fortunately, in the case of infographics, the outlook doesn’t have to be quite so bleak. Now, before I share the tools I prefer, I’d point out that for truly outstanding designs you are going to need the skills of an expert. I’ll talk about the free way I’ve been able to put together some flow charts I like, and how to best utilize these elements in WordPress, but if you really need something great, I’d contact an expert or at least check out Fiverr. With that out of the way, here’s how I finally found a nice free way to create DIY infographics. As I was writing an advance review of Marvel Comics: The Untold Story, it occurred to me that I could really use a ‘Christmas Gift-Buyers Guide’ to the book. Throughout the review I kept asking who this book was really for, and what kind of reader might actually enjoy. It became clear pretty quickly that a nice-looking flowchart could help interested readers a lot more than my usual textual ramblings. My initial Google research was pretty disappointing. There are plenty of great resources for infographics out there, but most either focus on visualizing data (not really my focus for this post), or only offer their services for a fee (you know, like a logical business might). Finally, I found my way to Creately. It doesn’t take much more than a cursory glance to realize this tool is perfect for any flowchart needs. Although you’ll need to pay for most of the features in Creately, there is a free version that can work for most casual, DIY purposes. The primary limitation is that you’ll only be allowed to have one project at a time. If you think you’ll need more than that, you can upgrade to unlimited projects for $5 a month. The Creately interface is very easy to use. For the most part, you’re able to simply drag and drop any diagram elements you’d like to use. From there it’s just a matter of committing yourself to playing with the tool and deciding on the color scheme and visual design you prefer. 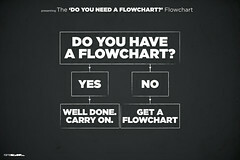 Creately flowcharts in an instant… of long hard work. The main caveat I’d point out with Creately is that putting together a flow chart for your website is going to take a heck of a lot of time. This isn’t really a Creately specific observation, but your first time putting together an entire flow chart from scratch means putting a lot of thought into the overall design. Creately gives you the option of selecting previously constructed templates to start from, and honestly this might be a better option if you’re in something of a time crunch. Once you’ve used Creately to craft a flowchart you’re happy with, you can export the file as an image. I’d recommend exporting as a .PNG here, as a .JPEG will do a little more damage to your site load time. From there you can simply add the flowchart as you would any other image to your WordPress post or page. This is where it gets kind of tricky. In all likelihood, you’ll notice that your flowchart is either way too big, or way too hard to read within your blog post. You can try to work with image compression and resizing like a Photoshop wizard, or you can do what I did. I highly recommend Lightbox Plus for WordPress. This plugin will quickly and easily make it so that your readers can click on any photo and instantly see the photo expanded. This is perfect for infographics with smaller text. This way you can include the flowchart image within the pixelated confines of your post, and not worry about readers having a miserable time trying to read the information. All they have to do is click and voila! Now that you’ve created and added your flowchart, it’s time to think about really maximizing the linkbait potential. You’ve probably spent a good deal of time creating a graphic you’re proud of, and if you really believe people will find it useful, there’s nothing wrong with a little self-promotion. For this, I recommend the Embed Code Generator plugin. Using this plugin, you’ll be able to offer an easy copy-paste option for anyone that wants to use the infographic you’ve created on their site. It’s a very natural way of crediting your work on their site, and allows you to potentially generate some high quality inbound links and referral traffic from anyone clicking the shared infographic. The embed code plugin will add the above template to your WordPress posts. All you have to do is add the link to your image source (if you’re unsure, add the image to your post and then click the image in the live post. You’ll see a URL with ‘wp-content/uploads’ in the URI. Copy and past). The rest of the information is optional, but I’d recommend at least linking the image to your original post for potential referral traffic. Crediting your site seems reasonable as well, but if you’d rather not force that on people, you don’t have to. So that’s how I got past my fear of infographics. Are there several hundred thousand other possible ways to achieve the same goal? Probably. This one’s worked for me so far. Have a similar experience or preferred way of creating infographics? I’d love to hear about it below! Ah, neat. I’ll have to play around with that some. Thanks Nishadha! Was definitely not disappointed, although this is 2 years old, it still answered my need. I was trying to create a flowchart for my medical blog to explain the process of acquiring cerebral palsy. Anyway, there you go, you gave me the solution, just want to say thanks for sharing! Thank you Dave! I found exactly what I was looking for and am implementing this into my site now.